There’s nothing wrong with opting for formula instead of breastfeeding exclusively. But if you do decide to go with formula, why not go with one that’s organic and also contains all of the nutrients and vitamins your baby will need? The Holle Baby and Baby’s Only Organic FormulaBaby’s Only Formula are both organic options for just that. They’re both dairy-based and can be used right from the start as your infant’s primary formula. So you won’t have to worry about finding a newborn-friendly formula in place of either of them to start out. They both contain all of the necessary nutrients your baby will need during their first year, but, as to be expected, there are some differences among the two formulas. 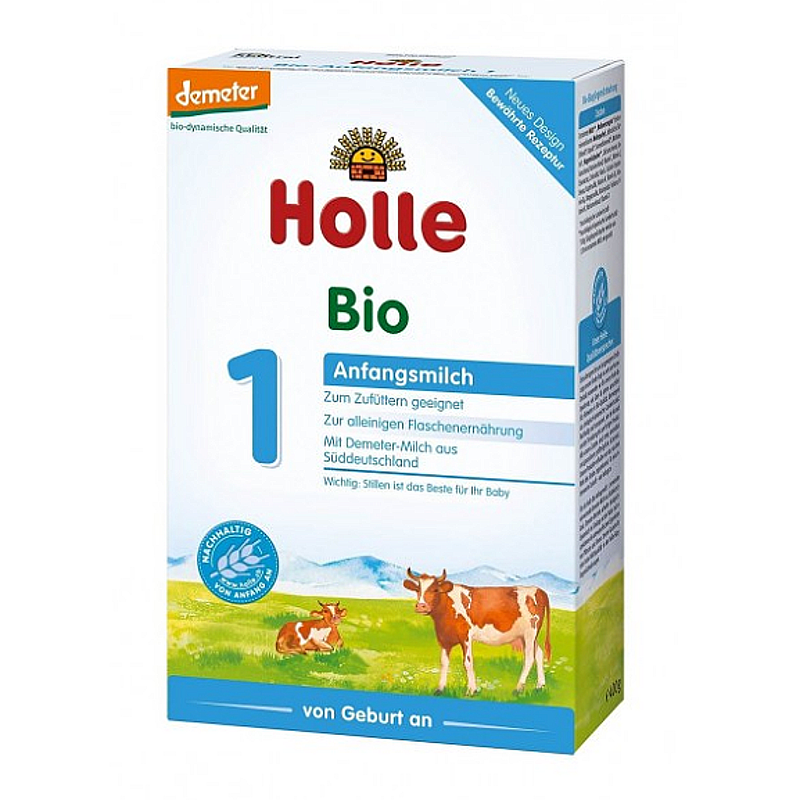 Unlike many other milk-based formulas, the Holle comes from cows raised on biodynamic arms in caring and environments. This makes for a healthier and more free range option and can also give parents peace of mind. The Baby’s Only Formula doesn’t come from cow’s raised on such farms, but it is offered in the U.S., whereas you’ll have to be located in the U.K. or purchase the Holle Baby Formula online. Either way, your baby is sure to take a liking to these formulas because of their closeness to the real thing, and you can rest easy knowing that. But before you take a chance on either formula for your little one, it’s important to look at them both from every angle to determine which your baby will actually take to. 4 The Verdict: Holle or Baby’s Only? The Holle Baby Formula is primarily available in the U.K and EU., but you can still buy it online and keep it in supply for your baby. That means the hardest thing to get used to will probably be making sure you always have enough in your home if you have to rely on ordering it through the mail. But it’s made with cow’s milk from biodynamic farms, which makes for some of the best milk your infant could have in their powdered formula. It’s generally easy to digest for most babies and has no added sugars, flavors, or colors. You can use it as your baby’s primary formula, or as an alternative, if you need to switch between formula and breastfeeding. You can also use it to mix in with Holle brand cereals once your baby is ready. Plus, it’s made with organic starch to thicken it, which keeps it easy for little tummies to break down. Different Stages: It comes in PRE, Stage 1, Stage 2, Stage 3, and Stage 4, which means you can use it for your newborn through 12 months and on. Nutritional Benefits: It has important vitamins and nutrients including vitamin A, vitamin B1, and vitamin B6. It’s also made with a protein balance that makes it close to breastmilk. Available Sizes: Its typical size is a 14-ounce container. BuyOrganicFormula: You can generally find the 400 gram containers for a very attractive price here, but you can save an additional 5% if you use code BABYSWAG5 at checkout. Babykind Market: Babykind is another great option. Similarly, they offer a special discount for our readers. Just use code BABYKIND-TBS at checkout to save $5 off of your first order. OrganicStart: They have perhaps the largest selection of European formulas online, so be sure to check here for bulk discounts. Has This Item Been Recalled? : Holle formula has not been recalled. Overall, the formula has a long enough shelf life so you can purchase a bulk supply ahead of time. It’s relatively affordable for most parents. It’s less likely than some other formulas to make your baby constipated or uncomfortable. Your infant probably won’t be able to tell the difference between the formula and breastmilk, so you can potentially switch back and forth between them. It’s not available in the U.S., so you’ll have to rely on buying it online every time. Since it’s made with organic starch as a thickening agent, you may need to mix it more than once to allow the powder to dissolve. In the off chance that your baby doesn’t like the formula, there’s likely nowhere physical to return it to. “I love this formula but can’t find it anywhere in the U.S.A.! I bought from this company in the U.K. and I had it in less than two weeks. My baby loves it and we have never had any problems with it. No spitting up and no gas or colic. I love that is is organic and from biodynamic farming. Glad I found it!” – Heather W. on Amazon. “Probably the best-powdered milk available anywhere. Probably the most expensive, but then what price do you put on health? All organic, and biodynamic – milk from alpine cows in southern Germany. It couldn’t be any better. And our baby loves it.” – Tuco Ramirez on Amazon. “This formula is the most natural that I have been able to find and was delivered even quicker than promised. Baby loves it! Would definitely order again.” – L. Raymond on Amazon. “Rest assured parents this is the best alternative to breast milk that is on the market. My son is eight months old and we have supplemented with Holle 1 & 2 since he was two weeks old. I researched endlessly and this was the only milk that was organic and did not contain harmful ingredients. Many of the American organic formulas still contain harmful ingredients like DHA, corn syrup, and other additives.” – Jackie R. on Amazon. What sets apart Baby’s Only Organic Formula is that, oddly enough, it’s marketed as a “toddler” specific formula. In fact, the Baby’s Only customer service representatives even say that because of that, parents should consult their child’s primary care physician to determine if they can take the formula regularly. This makes it unclear if the formula is the right kind for newborns or even younger babies, but it does have a lot of nutrients that babies and toddler need. It’s an organic formula option with non-GMO ingredients, no added corn syrup, and no artificial flavors. It’s also made with fatty acids that become DHA and ARA, which are needed for healthy development. 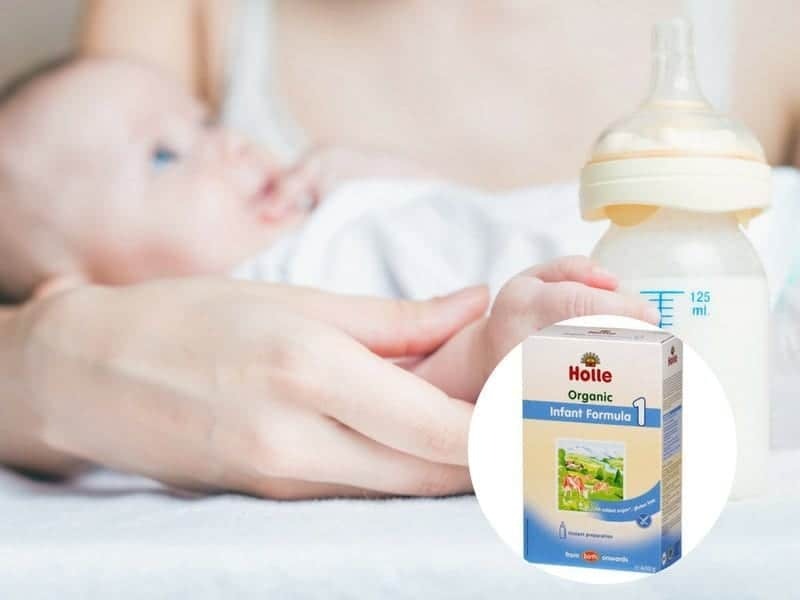 The formula can be used in place of breastmilk for toddlers ages one and up and it can also be combined with baby cereals in proper measurements. Because it’s made for toddlers rather than infants, you will need to introduce a different kind to your baby at birth, but if he or she can get used to this after the one year mark, it’s a solid organic formula option. Different Stages: It comes in just one stage, which is “toddler” and technically meant for children ages 12 months old and up. Nutritional Benefits: The formula contains DHA and ARA as well as vitamin A, vitamin C, and calcium, among many others. Available Sizes: It comes in a 12.7 ounce can or a pack of six cans together. Price: On Amazon, a 12.7-ounce can of Baby’s Only Organic Formula is $13.11. Check out the latest price! Has This Item Been Recalled? : There are no recent, or current recalls on the formula. It can be helpful for little ones prone to acid reflux. You can mix it with breastmilk or use it interchangeably with your supply. It’s relatively affordable, especially when purchased in bulk. The nutritional value is hard to compare when it comes to other similar organic formulas. It’s made for toddlers as opposed to infants and then toddlers. If you don’t measure out the scooped formula properly, it can constipate your toddler. To order it on the manufacturer’s website, you have to choose a subscription service as opposed to a one-time purchase. “One of the best thing I have ever found for my daughter! As a parent of a child with reflux problems, it is so hard watching her go through it. I wish all babies never have to go through such a thing. I was at my wit’s end when I found this and thought I would try it. This formula is fantastic and has helped my daughter so much. It is so gentle on the stomach and my daughter found it quite palatable.” – Caitlin Goodrow on Amazon. “I have gone through about seven different formulas with my 3.5-month-old…Before trying another reflux med, I decided to try this formula first in hopes that she really just has a dairy intolerance. Wow. I am so happy so far…it’s been almost a week. She doesn’t fight me to eat anymore; she actually enjoys eating. The formula doesn’t smell or taste bad, and she’s actually eating more now than ever before without me forcing her.” – Erica Cavaliere on Amazon. “This stuff is great. My wife put in a lot of time researching what to offer our daughter, as she was having a hard time keeping up her supply. Our LO had no issues adapting to this. It’s a product I feel good about feeding her as a supplement/alternative to BM. She hasn’t been constipated or anything, and is still in the 50th percentile for weight for her age, which is great.” – Mike K. on Amazon. The Verdict: Holle or Baby’s Only? At their core, Baby’s Only Formula and Holly Baby are fairly similar. They’re both organic milk-based alternatives to breastmilk, and they can both be used with breastmilk too. But at the end of the day, the Holle Baby Formula may be the best option for your baby. It could vary from baby to baby depending on what they specifically like, but the Holle offers a formula that they can have right from the start. It’s also organic and has tons of natural vitamin and minerals, which are beneficial to your baby in the long-term sense. The Baby’s Own Formula is a solid option to be sure, but the Holle is the stronger formula in this instance. Regardless of which formula you choose, or if it takes going through both of them before figuring out which one your baby likes, you’re going to have one that’s healthy and nutritious. The goal here is to find a formula that’s both nutritious and tasty for your infant as he or she grows. Sometimes, you can have one without the other, and since it’s up to your baby if he or she eats it, you need to have a formula that provides both. Both the Holle and Baby’s Only Formulas offer both of those. The taste of them both might vary, depending on your child, but they’re both sure to keep your child on the right track developmentally. As long as your baby is happy and healthy, that’s all that matters. Bottom Line: Personally, I prefer going with Holle here as it as the more stringent EU Organic certification and has fewer additives and fillers. Holle Baby Formula I am often asked which baby formula I actually use at home. The Answer is Holle. Yes, slightly more expensive but the quality ingredients are worth every penny. Use code BABYSWAG5 to save 5% via BuyOrganicFormula.com Save 5% Here We earn a commission if you click this link and make a purchase at no additional cost to you.